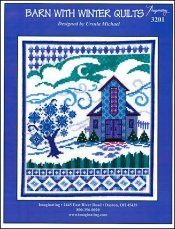 Barn With Winter Quilts [G6469] - $6.00 : Yarn Tree, Your wholesale source for cross stitch supplies. Cross stitch chart from Imaginating. Designed by Ursula Michael. The winter wind is howling in the air. A winter storm is beginning to move in. A beautiful barn sits in the countryside with snow beginning to decorate the roof & walkway leading up to the doors. Look at the beautiful quilts that decorate the barn. As you stitch this design, imagine driving through the countryside & coming upon this beautiful barn. Stitch count 117v x 139h. Stitched on #2936 Zweigart Aida 14ct White 59" wide or #8221 Zweigart Aida 14ct White 43" wide.